Nickname(s): Capital da Alegria (Caipital o happiness), Roma Negra (Black Roum) an Bahia Judia (Jewish Bay). Salvador (Portuguese pronunciation: [sawvaˈdoʁ], Saviour; historic name: São Salvador da Bahia de Todos os Santos, in Scots: "Ceety o the Holy Saviour o the Bay o aw Saunts") is the lairgest ceety on the northeast coast o Brazil an the caipital o the Northeastern Brazilian state o Bahia. Salvador is ent as Brazil's caipital o happiness due tae its easygoin population an coontless popular ootdoor pairties an aw, includin its street carnival. The first colonial caipital o Brazil, the ceety is ane o the auldest in the Americas. For a lang time, it wis simply kent as Bahia, an appears unner that name (or as Salvador da Bahia, Salvador o Bahia sae as tae differentiate it frae ither Brazilian ceeties o the same name) on mony maps an beuks frae afore the mid-20t century. Salvador is the third maist populous Brazilian ceety, efter São Paulo an Rio de Janeiro. 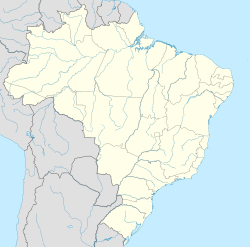 The metropolitan aurie o the ceety, wi 3.5 million o fowk, housomeibver, is the seivent maist populous Brazilian urban agglomeration, efter the urban auries o Sao Paulo, Rio de Janeiro, Belo Horizonte, Porto Alegre, Recife an Fortaleza, an the third in Brazilian Northeast Region. ↑ Brickell, Margaret (July 1991). "If You Only Have a Day in Salvador da Bahia". Cruise Travel. 13 (1): 25–26. Retrieved 29 April 2011. ↑ 4.0 4.1 4.2 4.3 4.4 4.5 4.6 4.7 4.8 4.9 "Mayor's International Council Sister Cities Program". Salvador, Bahia. Retrieved 2008-08-17. This page wis last eeditit on 17 October 2018, at 15:32.